We are a leading Manufacturer of china clay powder, china clay and calcined clay from Vadodara, India. China Clay Powder also known by the name Kaolin is soft and white clay that is considered to be an essential ingredient for making porcelain. Moreover, it finds implementation in various industries such as paint, paper, and rubber are to name a few. In order to fulfill diverse market needs, we offer an extensive array of China Clay Powder, which when combined with water takes the form of plastic. The shape of this plastic remains the same even after the removal of pressure. When the percentage of water is more, the offered clay forms a watery suspension that is extensively used within the ceramic industry. China Clay forms the basic raw material as an extender for Water-based decorative paints. Solvent-based decorative paints. Protective and OEM coatings, domestic appliance finishes, electrophoresis coatings, coil coatings. China clay due to its lamellar structure imparts toughness to coatings and tends to reinforce the films. Due to its low solubility in the aqueous phase and its ability to impart good brushing and leveling characteristics, it is mainly used in latex paints. In adhesives sealants, china clay gives good barrier effects and rheology control. The controlling rheology influences the speed at which adhesive can be applied which is important in high speed paper laminating processes. The low surface hydroxyl content of calcined China clay leads to a low moisture pick-up, resulting in an excellent performance in moisture sensitive sealant applications. It is used as a filler in combination with others to impart strength smoothness in plastic Industry for PE master batch; PE cables, PE film, PVC cables, PVC extrusions, PVC plastisols, PP moldings, polyamide moldings, PBT/PET moldings, unsaturated polyester, urea formaldehyde, phenol formaldehyde. China Clay is also called KAOLINE, it is one of the essential Raw materials for Ceramic Industries. China Clay does not swell on adding water Alumina present in Clay do not form Isomorphous series with any other metallic compound. 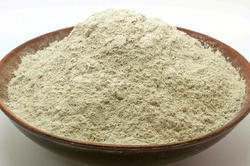 It is naturally hydrated Aluminum Silicate and is one of the most abundantly available clay in the Earth's crust. China Clay is the heart of potteries, tiles, ceramics, Glazes and many other industries. The China Clay can be effectively used in the manufacturing of fiber glass because of its high alumina content. 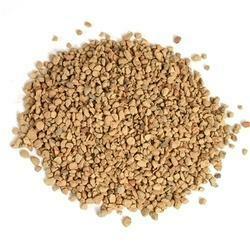 It is used in the variety of papers, cardboards, hard boards and others. China Clay is used as a filler which reduces its overall cost, improves its printing properties such as brightness, smoothness and gloss. China Clay is incorporated into both natural and synthetic rubber compounds and is the rubber industry’s most widely used non-black filler with reinforcing properties: Cable insulations: cable sheath, hose, extrusions, belting, footwear, pharmaceutical, seals, general moldings, plant lining, domestic moldings, latex, tires/inner tubes. Grit-free china clay having low bulk density, possessing reinforcing properties, is used as filler and to improve tensile, flexural modules make a significant increase. It is used for Electrical insulation, High voltage insulation components, electrical wires, EPDN rubber and others. 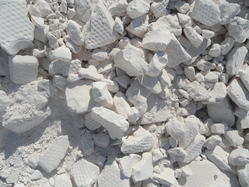 China Clay is used in toothpaste, cosmetics and soap industry. China Clay, also known by the name Kaolin is soft and white clay that is considered to be an essential ingredient for making porcelain. Moreover, it finds implementation in various industries such as paint, paper, and rubber are to name a few. In order to fulfill diverse market needs, we offer an extensive array of China Clay, which when combined with water takes the form of plastic. The shape of this plastic remains the same even after the removal of pressure. When the percentage of water is more, the offered clay forms a watery suspension that is extensively used within the ceramic industry.